The life of a house depends on how well all parts of its construction are made. And the roof is no exception, because it protects the ceiling from precipitation and sunlight. In addition, the roof allows you to divert excess moisture from the walls of the building. If you decide to do your own rafters, you need to familiarize yourself with the features of their construction. 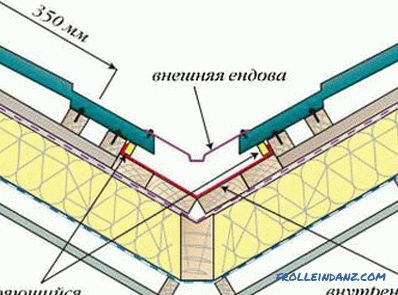 Schematic of the roof system of a gable roof. Today there are many types of roofs. Despite the variety of structural features, they are all attached to the frame of the house with the help of rafters - wooden beams, which can be installed either directly or at a certain angle to the walls. Subsequently, wooden elements are mounted on the beams, on which, in turn, the roof is laid. Before you make rafters, you need to familiarize yourself with the basic design features of different types of roofs. The most simple for arranging with your own hands are single or dual slope roofs. It is these that are most often used in the construction of country houses. At the same time, the leaning constructions are mainly erected with the arrangement of outbuildings: sheds, temporary shelters and other outbuildings. During the construction of residential houses, broken or double-sloped roofs are used. These types of roofs consist of complex structural elements, so if necessary, their manufacture is better to seek help from specialists. If we talk about rafters, they are also divided into two types and can be nylon or hanging. The external or internal walls of a building usually act as a support for hanging rafters. The upper end of the beam is attached to the ridge girder. The lower parts of the beams rest on the extreme supports, which are the walls of the house. When installing hanging rafters, it must be remembered that this type of structure does not have an internal point of support. Incorrect installation can lead to the fact that the pressure of the roof elements on each other will become too high, which can cause the walls to overturn or collapse. 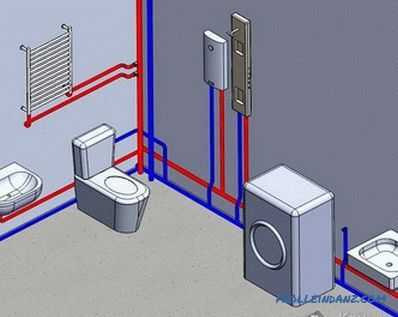 To prevent this from happening, all elements of this design must be firmly connected to each other. To do this, in the lower part of the truss system settles belt-tightening, eliminating the spread of the construction farm. The assembly of a hanging truss structure can be done both on the house and on the ground. In the second case, in order to raise the roof to the building, you will need to use a crane. In contrast to the hanging structure, suspended rafters are attached not only to the ridge girder, but also to the internal support, which makes the process of erecting this system quite simple and does not require the use of special mechanisms and equipment. Before you make rafters for a dual-pitch roof, you should decide which materials will be used to make them. 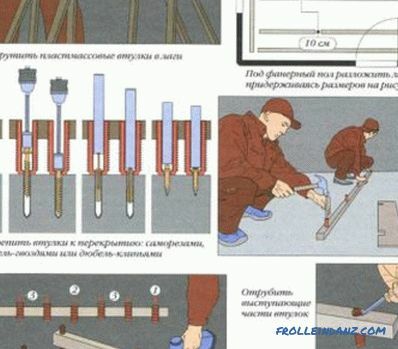 Installation scheme of inclined rafters. 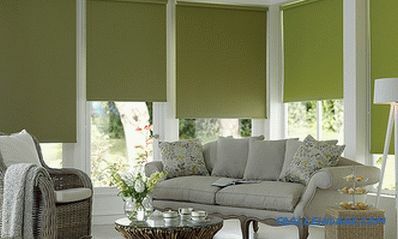 Here you also need to focus on the recommendations of experienced builders. 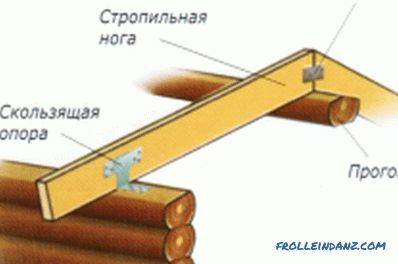 For example, many craftsmen do not recommend using logs for beams, due to their high weight. In addition, it is desirable to use as a fastener material not nails, but screws. And in fact, and in another case, you will need to use linings and liners. using both racks and struts. In this case, W is the distance between the walls of the house, L is the angle of inclination of the roof, H is the difference between the walls. The cross section of the bars or planks that will be used for the manufacture of elements of the truss structure depends entirely on their length. So, with a rafter height of 3 m, material with a cross section of 8x14 cm to 10x12 cm can be used. The height of the elements of 4 m will require the use of a board or bar with a cross section of 8x18 cm to 10x10 cm. A bar or board with the largest section of 8x22 cm or 10x20 cm should be used in the case when the length of the rafters of the roof is not less than 5 m.
In order to make the rafters correctly, you first need to install the power plate. This term refers to the element of the roof, usually made from a log or a bar. It is in the mauerlat that every detail of the truss structure is installed. 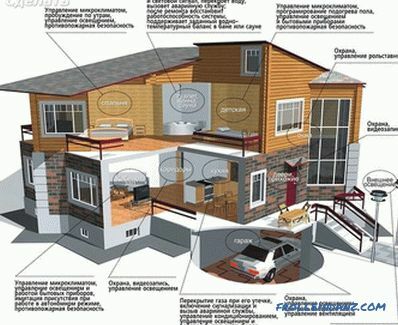 Thanks to this element, the load on the weight of the rafters is distributed over the entire area of ​​the house. 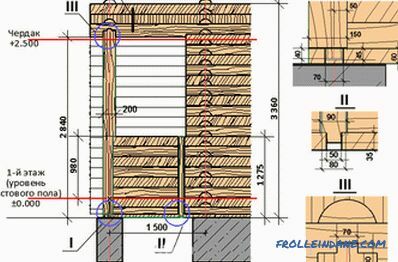 The number of mauerlat depends entirely on the number of pairs of rafters, since the lower end of each rafter element is fixed in the groove cut in the mauerlate. 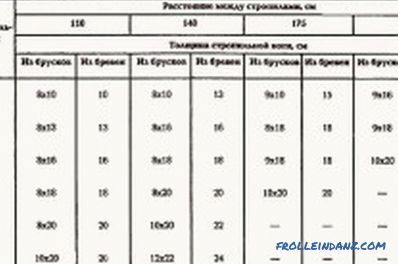 Section selection table for rafter legs. 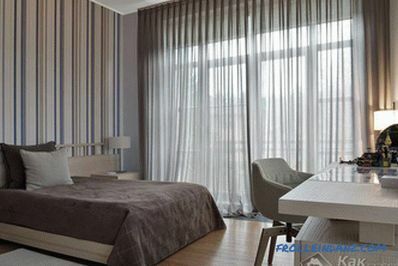 Mauerlaty are installed on the walls and ceiling beams of a building under construction. At the same time, both from one and the other side, its carrying over the walls of a house should be from 40 to 60 cm. Take-away should have the same value along the entire length. There are several ways for mounting a power plate: fixing with staples, wire winding, fixing with long nails, etc. At the attachment points to the power plate, we make grooves that must fully comply with the spike at the end of each rafter. The grooves should be located at the same distance not less than 6-8 cm from the end of the bar or log. When the required number of mauerlat of the same length is installed on the walls of the house, you can do the installation of the truss system. The design is made taking into account the step between the rafters of no more than 2 m. If the thickness of the beam or board is minimal (about 40 mm), the step can be made smaller. 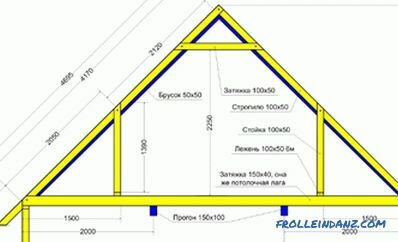 In order for the rafters for the roof to be folded at the right angle, based on the calculations using the above formula, a template is made of boards. According to this template, all the necessary distances are measured and a spike is cut that corresponds to the slot in the mauerlate. On the basis of the prepared template, spikes are made at the bottom of all truss elements. At the upper end of the elements, grooves for fixing the ridge girder are sawn at a certain angle. The angle depends on the angle of the roof and the size of the skate beam. The ridge can be mounted above the center of the rafters or, on the contrary, under them. Using a skate increases the rigidity of the truss structure. 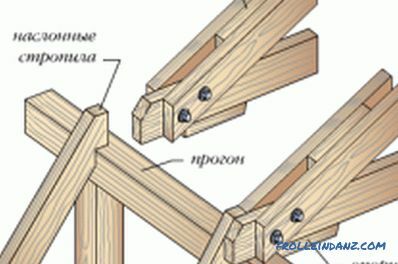 It is possible to fix the rafters without a ridge girder: usually this method is used in the construction of small buildings, the roof span of which is less than 4.5 m. In this case, the upper ends of the truss elements are cut out under a certain angle so that each pair has a groove and spike that will securely fasten to each other. The prepared rafters are raised to the base of the roof and mounted in slots on the power plates. Each rack can be fixed either with staples or long nails. In the case when the ridge run is used, it is desirable to install additional posts under the rafters, which will exclude the possibility of their sagging. The posts are installed from the board, the cross section of which is smaller than the cross section of the rafters, and fixed on the power plate. When the rafters for the roof are installed, it is necessary to prepare the crate for fixing the roof. The type of lathing depends entirely on what kind of roof will be laid on the roof elements. For example, the crate with a step from 10 to 50 cm is suitable for mounting metal, slate and sheet roofing materials. A crate, the distance between the elements of which will be no more than 1 cm, is required for rolled materials, sheet slate or soft roofing. 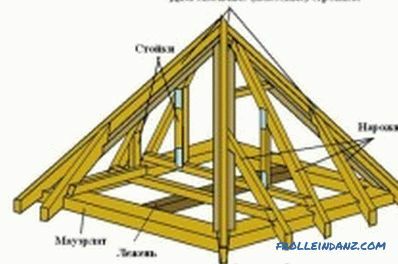 If you need to make a truss structure with your own hands, you can use the above recommendations. If the work is done carefully and carefully, the roof of the house will be reliable and will last a long time.